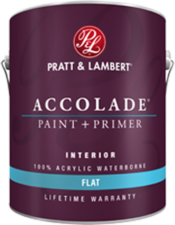 Pratt & Lambert® Accolade® Interior Paint + Primer is our finest interior paint. It is formulated to go on smoothly and provide a rich, luxurious coating for a beautiful, stunning finish. The 100% acrylic formula is durable and easy to maintain. It is available in Flat, Satin, Semi-Gloss, and Gloss Finishes, and comes with a Lifetime Warranty. Accolade®. Trusted performance, proven results. 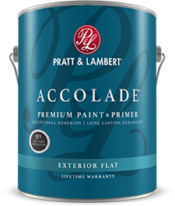 Accolade® Exterior Premium Paint & Primer is a 100% acrylic house and trim paint designed to withstand harsh winter and summer weather extremes. This highly durable paint features exceptional adhesion and is specially designed to resist blistering, chipping, peeling and chalking, while also providing a mildew resistant coating that may be applied in temperatures as low as 35°F. 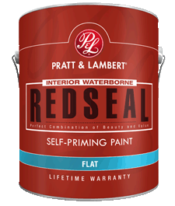 Pratt & Lambert® RedSeal® Interior Self-Priming Waterborne is a premium quality latex wall coating that provides excellent coverage and a smooth finish that’s amazingly durable and beautiful. Expect a high quality, washable and scrubbable finish with excellent hiding and easy application. It is available in Flat, Eggshell, Satin, and Semi-Gloss Finishes, and comes with a Lifetime Warranty. 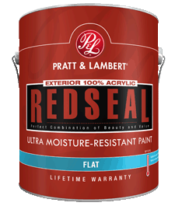 Pratt & Lambert RedSeal® Exterior Ultra Moisture Resistant Waterborne Paint is the perfect combination of beauty and value. It applies smoothly, offers great coverage, provides exceptional durability and color retention, and gives a mildew-resistant coating. With excellent resistance to moisture after only 1-1/2 hours dry time, and application in temperatures as low as 35°F, RedSeal Exterior helps to improve productivity by reducing the impact of adverse weather. 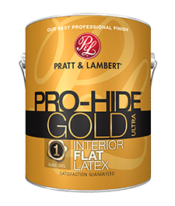 Our best professional quality paint, Pro-Hide® Gold Ultra Interior Latex delivers a uniform finish with outstanding hide, smooth application, and exceptional touch-up. It is ideal for residential / commercial repaints and new construction. It is available in Flat, Eggshell, Mid-Sheen, Satin, and Semi-Gloss finishes, and Satisfaction is Guaranteed. 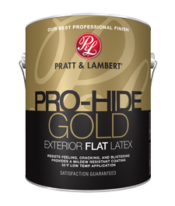 Pratt & Lambert Pro-Hide® Gold Exterior Latex Paint is the premium choice for professional painters. With a rich, smooth flowing formulation, it’s easy to apply and highly durable. May be applied in temperatures as low as 35°F. It is ideal for residential / commercial repaints and new construction. It is available in Flat, Eggshell, and Semi-Gloss finishes, and Satisfaction is Guaranteed. 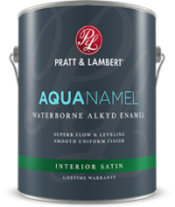 Aquanamel™ Waterborne Alkyd Enamel is a premium quality coating that offers superb flow and leveling and a smooth, durable finish. It provides the convenience and ease of use of a waterborne coating with the application and performance of a traditional oil-based paint. It is easy to apply and cleans up with soap and water. It is ideal for use on interior trim, doors and cabinets. Perfect for Cabinets, Doors, and Trim. Superb Flow and Leveling for a smooth, uniform finish. Cures to a hard, durable finish. Excellent brush, roll, and spray application. Cleans up with soap and water- no solvents required. 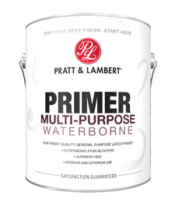 Pratt & Lambert® Interior/Exterior Multi-Purpose Waterborne Primer is specially formulated to promote the superior performance of our topcoats. Count on this high quality primer for outstanding adhesion, excellent sealing and hiding, and fast dry time. It is also available in Deep Base. When tinted, the Deep Base Primer increases the coverage of dark color topcoats.